> Commercial & Industrial > Types of Commercial Roofing? We care about your commercial property and the state of its roof. At New View Roofing, we understand that the condition of your facility’s roof contributes to the success of your business. That’s why we offer a variety of commercial roofing products from trusted manufacturers to ensure your roof is sturdy, energy-efficient, and able to withstand the elements and protect your operations. 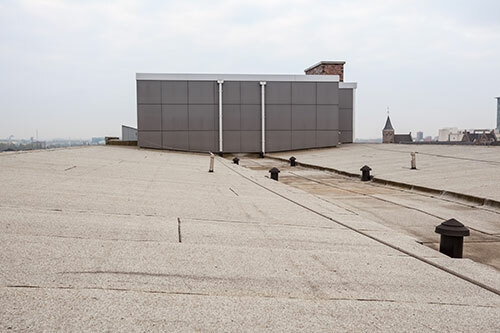 Single-ply membranes are one of the most popular commercial and industrial roofing materials for flat roofs. This type of roofing consists of sheets of rubber or other synthetics that are chemically adhered or otherwise fastened to create a layer of durable, energy-efficient protection for your new roof. TPO and PVC are both single-ply membranes that have adhered seams. However, there are some differences. TPO and PVC roofing have different chemical formulas that result in slightly different performances and service lives. Find out more about TPO vs. PVC roofing. Metal roofing is durable, energy-efficient and fire-resistant. New View Roofing offers custom sheet metal application to fit your commercial facility specifically. For added protection, we also specialize in roof coatings and waterproofing to protect a metal roof against rust, UV rays and other elements. Also known as “tar and gravel” roofing, built-up roofing is installed by alternating layers of tar or asphalt and industrial fabric on the roof. The final layer of a built-up system typically consists of gravel or stones. Built-up roofs are low-maintenance and incredibly waterproof since they don’t result in joints or seams that are vulnerable to leakage. New View Roofing is an experienced Dallas commercial roofing contractor providing specialty roofing products for your commercial or industrial roof system. Schedule a new roof estimate by calling (469) 232-7220. You can also fill out our contact form. We look forward to serving you!